The term fetal monitoring generally refers to the process of listening to and interpreting the heart beat patterns of a baby during labor and delivery. Doctors and nurses watch and interpret the fetal heart patterns to assess whether the baby is under too much stress and decide if they need to intervene in the delivery. This page will review history and evolution of fetal monitoring and examine the modern methods of electronic fetal monitoring. The earliest documented effort at fetal monitoring date back to around the 17th century when several European doctors began advocating the practice of placing an ear on a pregnant mother's belly to listen to the baby's heart rate. It was not until after the invention of the stethoscope in the early 1800s that the technique of intermittent monitoring of the fetal heart beat during labor became a common practice. This practice continued for another 100 years until an early fetal electrocardiogram device was developed in Germany in 1906. During these earlier years, however, fetal monitoring was primarily used only to check if the baby was still alive and not to evaluate fetal duress during labor. In 1958 a doctor from Yale University published a groundbreaking study which first explained how to identify fetal stress through continuous tracking of heart patterns. This led to an intense focus on the development of new and more advanced fetal monitoring devices. By the early 1970s the first generation of continuous electronic fetal monitoring devices were appearing in hospitals across the U.S. and Western Europe. 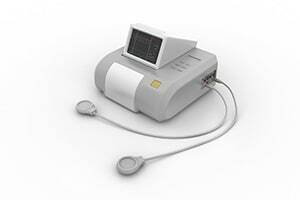 The introduction of EFM devices marked a genuine breakthrough in the medical childbirth process. By 1980 a study EFM devices were being used in 45% of hospital deliveries and just 10 years later EFM use was reported in 85% of deliveries. Today EFM devices are more advance and highly accurate and are used in over 95% of all hospital deliveries. Electronic fetal monitoring (EFM) or cardiotocography, is the most advance and accurate method of fetal monitoring. EFM monitors both the fetal heart rate (FHR) and the mother's contractions. A special ultrasound device is utilized to track the baby's heart beat and a pressure sensor measures uterine contractions. Both devices are embedded into adjustable monitoring strips which are strapped around the mother's belly like a belt. The fetal heart strip is strapped around the center of the abdomen and the strip that measures contractions goes at the top of the abdomen. Both strips connect to a monitoring terminal which displays the FHR and maternal contractions on a computer screen or a print out. The FHR pattern information together with the measurements of the mother's contractions are referred to as EFM tracings. The EFM tracings provide critical insight into the level of stress the baby is under during labor and birth. The FHR monitor identifies the normal baseline heart rate and then tracks how the rate rhythm accelerates and decelerates during each contraction. Interpreting the acceleration and deceleration FHR patterns in response to contractions tells doctors and nurses if the baby is under duress and may not be getting enough oxygen. Normal baseline FHR range is between 120-160 beats per minute. Baseline FHR refers to the fetal heart rate during the resting period between contractions. So bradycardia would be considered any baseline FHR below 120 for more than a 10-15 minute period. Tachycardia would be a baseline FHR traced above 160 for more than a 10-15 minute period. Deceleration refers to how the FHR slows down after a contraction. During a uterine contraction the FHR speeds up (acceleration) due to the compression of the placenta as the mother's uterus muscles push the baby through the birth canal. When the contraction ends the baby's FHR normally slows down (decelerates) in a slow, even pattern and eventually returns to the normal baseline FHR. When FHR does not decelerate in a normal pattern after a contraction it is a key indication that the baby is under stress. Sweha & Hacker, Interpretation of the Electronic Fetal Heart Monitor During Labor (AAFP 1999). Sartwelle & Johnston, Continuous Electronic Fetal Monitoring during Labor (Surg. J. 2018).